Detective drama Grantchester has been the success story of autumn 2014 for ITV. With an average audience of 6.6m viewers the series has been recommissioned for a second series in 2015. Based on the novels of James Runcie it follows Anglican vicar Sidney Chambers (James Norton) and Detective Inspector Geordie Keating (Robson Green) as they investigate wrongdoing in their Cambridgeshire village. 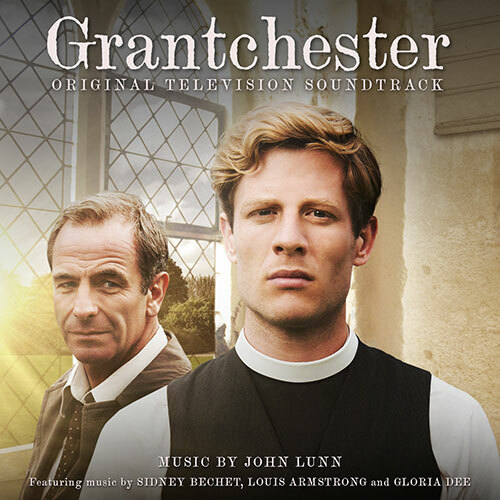 The 1950s set series is underpinned by John Lunn’s elegant score. The Scottish composer is famed for his Emmy award winning scores for Downton Abbey but his 25 year career as one of the UK’s foremost writers for music in television is equally glittering right across the board. Major credits include Hamish Macbeth, Murder In Suburbia, The Street, Criminal Justice, Hotel Babylon, Waking The Dead and Shetland. The character of Sidney Chambers is a keen jazz fan and that’s reflected by the inclusion of music from Sidney Bechet and Louis Armstrong. CD2 highlights the arrival in the series of the enigmatic Gloria Dee (Camilla Marie Beeput) and her quartet playing a selection of jazz standards.